-Going La La by Alexandra Potter: I really like Alexandra Potter's books and this sounds adorable. 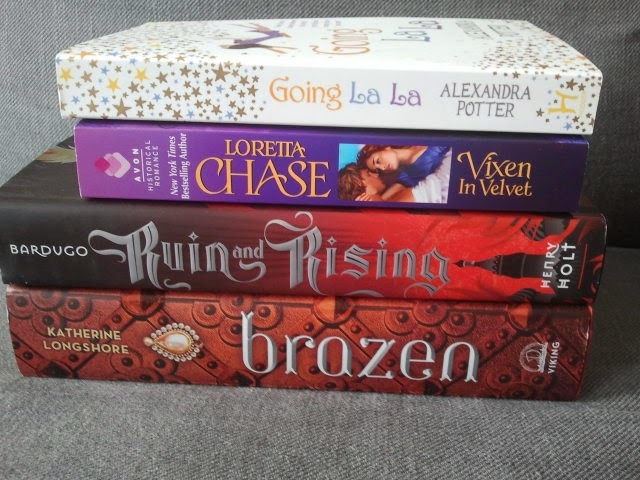 -Vixen in Velvet by Loretta Chase: because OBVIOUSLY I need to know how the last of these three sisters wins her man. -Ruin and Rising by Leigh Bardugo: OMG I ALREADY READ THIS AND IT WAS AMAZING!! And heartbreaking and just ALL THE FEELINGS. If you are interested, my raving review can be found here. I have series hangover. -Brazen by Katherine Longshore: because Katherine Longshore's books are awesome and I needed to have this one in my life as well. 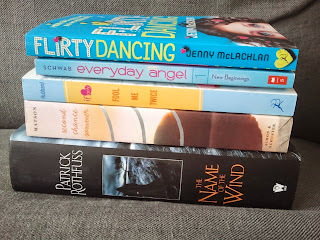 -Flirty Dancing by Jenny McLachlan: I crave fluffly contemporaries in the summer and this sounds like it has fluff potential. -New Beginnings by Victoria Schwab: every since she stole my heart with The Near Witch, I've been hoarding Victoria Schwab's books without actually reading them, but I do intend to! This sounds really cute! -Fool Me Twice by Mandy Hubbard: same goes for Mandy Hubbard, and I'm always the girl who wonders 'what if', and a what if you could get a chance at a do-over of a failed relationship sounds like my kind of book. -Second Chance Summer by Morgan Matson: so I keep hearing people rave about this book and I want in on the action. And I survived reading (and watching) The Fault in Our Stars, so I think I might be able to handle this as well now. -The Name of the Wind by Patrick Rothfuss: this book is amazing. And I already owned a paperback copy, but as my boyfriend is reading it, which is awesome, and he is not so gentle with my books as I'd like him to be, which is less awesome, I decided it was time to get the gorgeous hardcover for myself. So nobodoby but me is allowed to touch this. Ever. -A Little Something Different by Sandy Hall: so this was a gift from Debby @ Snuggly Oranges who is awesome and had an extra copy of this, it sounds super cute! 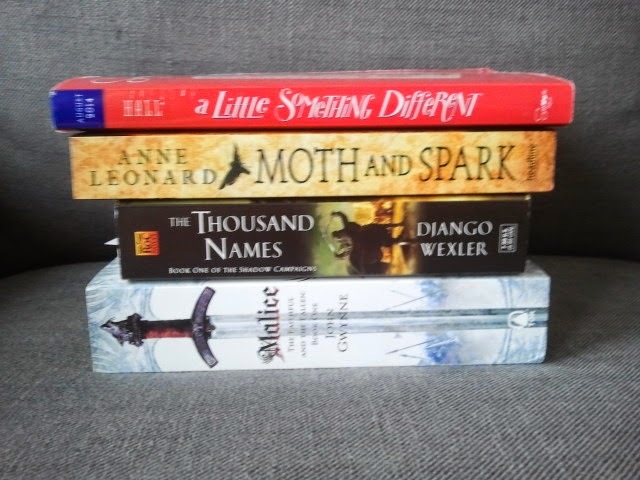 -Moth and Spark by Anne Leonard: I've heard AMAZING things about this book and when I came across it in the bookstore I just had to buy it because HELLO fantasy novel with dragons! -The Thousand Names by Django Wexler: this also sounds like a fantasy novel that will be right up my alley and I'm always looking for that next series to get lost in. -Malice by John Gwynne: it is epic fantasy and I have been eyeing this since it was released so when I got an e-mail saying the price had gone down I just clicked BUY and the rest is history. And I would also list all the awesome egalleys I received for review, but we're leaving to have dinner over at the boyfriend's parents' and I simply don't have the time, but they include The Book of Life by Deborah Harkness (which I've read and very much enjoyed), Killer Instinct by Jennifer Lynn Barnes, Illusions of Fate by Kiersten White and A Good Debutante's Guide to Ruin by Sophie Jordan, so I'm one very happy girl! 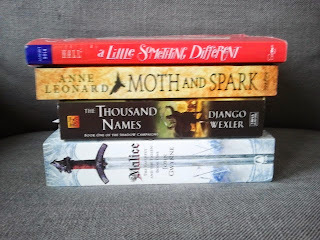 This is a great book haul! I've been eyeing Second Chance Summer for a few weeks and I think I may have to pick it up soon! Ooh, if you do, let me know what you think! I hate that when people don't send what they advertise it's so not right. I hope you find the cover you want..I would love to read the Robin Robb series as it sounds really good..need to put it on the TBR pile. :) Hope you enjoy your reads. Thanks! They do sound really good! Great haul! 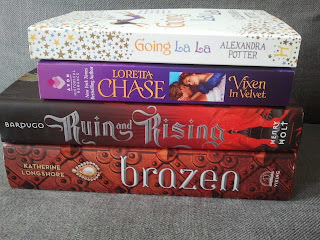 Ruin and Rising and Brazen are both on my TBR list. Can't wait to see what you think! Ruin and Rising is just LOVE! I hope to read Brazen sometime this summer! This looks like a great haul, I especially like the look of those last ones ... Malice. Even seeing the spine makes me want it ... because EPIC FANTASY. I know! I love the spine for Malice! 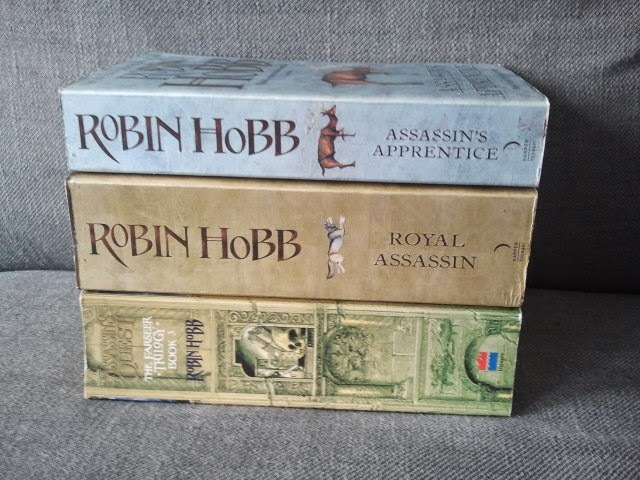 Robin Hobb is one of my favorite fantasy authors ever! 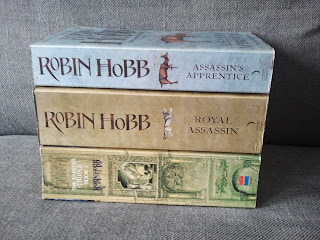 And I think that the Assassin's Apprentice series is still my favorite of hers (though all of her books take place in the same world and are all related in some way - so it's almost like it's just one big series). Hope you find the cover you want and love the series too! those are actually the old covers, my mum has them on the shelves in our library. (spare room). They're beautiful.